Gnomes going for a swim? Your petunia just won gold at the Olympics? Solve your garden and lawn water drainage problems with land drain! After a winter and typical British summer, of constant rain, your garden or lawn can be left waterlogged and soggy. With our ever changing environment it is hard to predict the weather from one week to the next. To keep your garden looking its best through storms and heavy rain, land drain is the ideal solution. 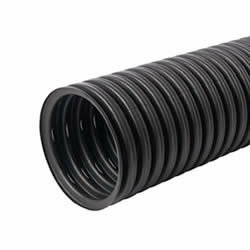 What products do you need for lawn drainage? The size of your lawn (or the area you would like to be drained) affects the size of pipe you will need. For smaller, standard garden lawns a 60mm perforated pipe would be used. 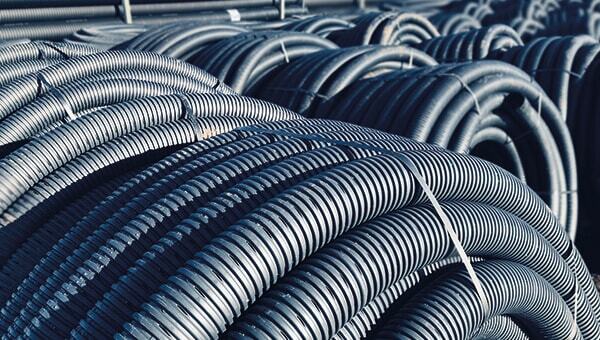 For much larger garden areas, an 80mm perforated pipe can be used. You will need gravel to replace the soil you remove; a smaller sized gravel is recommended. The heavy clay soil isn’t permeable enough for water to soak into and the water has nowhere to go so just puddles and sits on the surface. 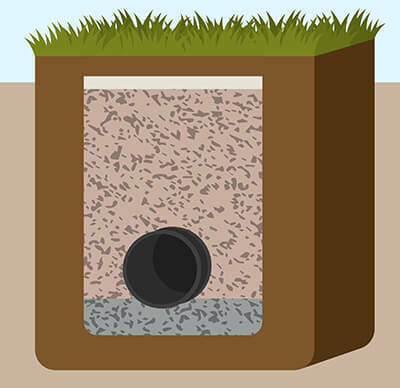 By replacing this with gravel this allows the water to seep through into your new lawn drainage system. 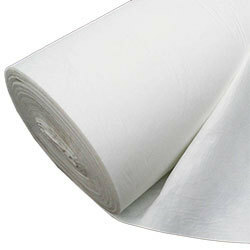 A geotextile membrane is also advised, which is basically a sheet like material which water can pass through but not debris, so protects the pipe from damage. 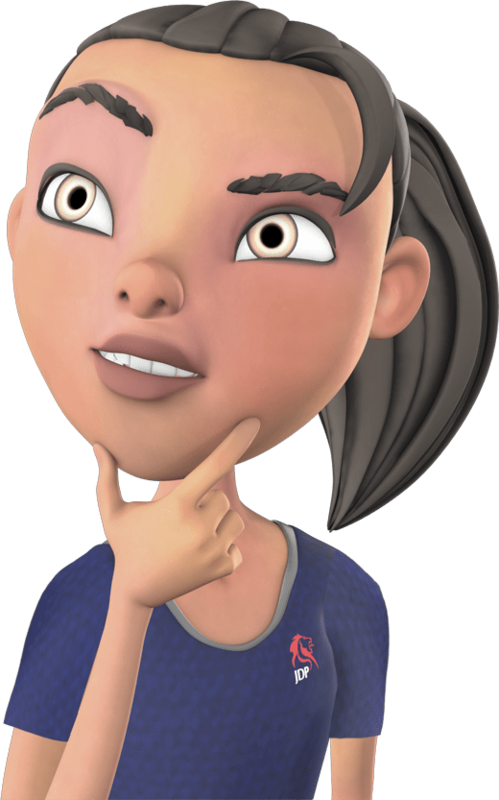 This is a relatively simple process and can be done in just a few steps. The trench needs to be wide than the diameter of your pipe and MUST be at least 450mm deep. This is important if you are planning on aerating your lawn - the pipe must be deep enough so it's not damaged by spiking or other maintenance. This should effectively wrap the whole trench to protect the system. This has to be at a slight angle down to ensure gravity does its job and the water flows. A 1% gradient is fine. The lengths of land drain can be cut easily using any conventional household hand tools and must be done in between corrugations. Using gravel allows the water to flow freely and seep down through into the land drain where the water is carried to a discharge point or a soakaway crate. Simply recover your trench with the rest of the geotextile fabric, the rest of the soil and grass and you have a complete lawn drainage system. 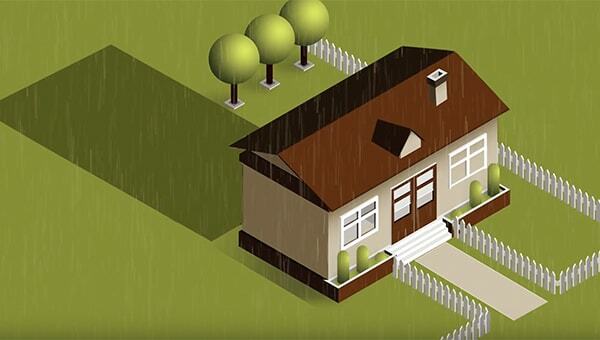 Why choose land drainage for your lawn? As you see in the steps above it is easy to install and can be done by yourself without any paid help if desired. 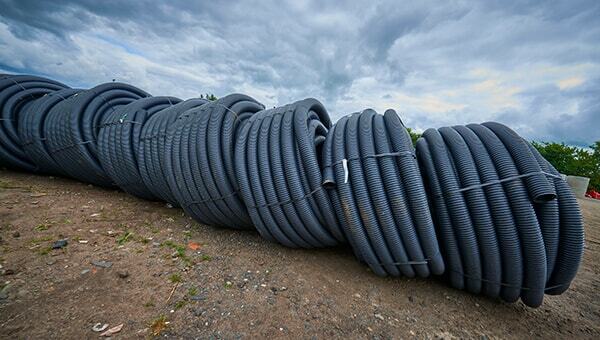 Land drainage is available in coils in various lengths from JDP meaning they are flexible and easy to transport and handle. Once installed your problem is fixed! 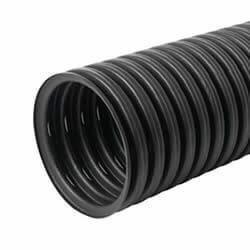 There’s no need to replace the system until the end of its life if installed correctly and the right diameter has been chosen this method should quickly solve your lawn drainage problem. TIP! 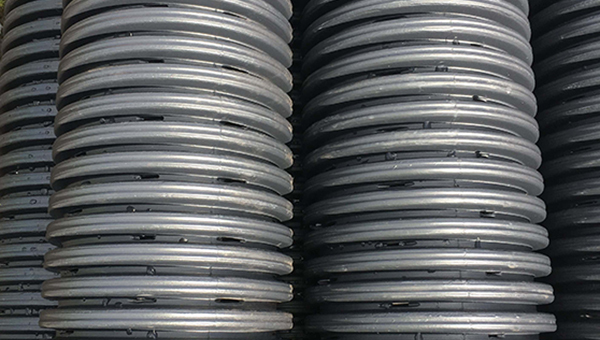 For an effective drainage system, junctions can be used to create a herringbone layout and connectors used to connect lengths of land drain together. Should pipe perforations go up, or down? 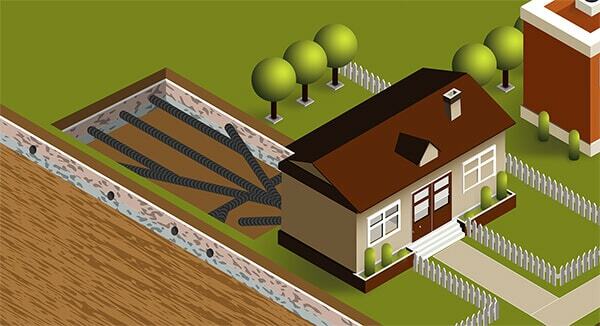 Land drain or French drain?